We had a friend visiting us from California this weekend. Apart from eating out and gossiping, we also had them over for lunch yesterday, you know, the typical "खाने पे आ जाना"! The menu was Punjabi Chole Masala, Puris, Capsicum Corn Curry, Couscous Pulao and salad. Will eventually put up all the recipes, but for now, let's stick to Punjabi Chole Masala. 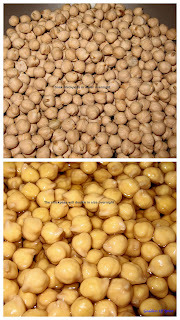 Kabuli Chana/Chickpeas/Garbanzo beans are a very popular in my house. Specially when served with puris. Infact, at my mom's place puri was always served with chole and meetha chutney (another recipe which I hope to put up soon). And how can I forget Shrikhand? Yummy! For the chickpeas, you can use the canned version, but I am a real snob when it comes to certain recipes! Seriously, in a pinch, I don't mind using canned beans, but if I have the time and I know in advance that I am going to make a certain dish, I definitely prefer soaking the beans over night. This recipe is one such, where I don't like using the canned ones. I cook the chickpeas with a tea bag. You can put a few tea leaves in a muslin bag/cheesecloth and use that as well. But I usually keep some masala tea bags handy just for this purpose! They impart a nice flavor and color to the chickpeas. How I came about using these tea bags is another story! Once DH got these masala tea bags when I was in India. But he hated the taste and just left them as it is. When I came back, I was left with this box of tea bags, so decided to use them for making chole instead of going through the pain of tying loose leaves in a cheesecloth. I loved it! Since then, I buy some masala tea bags and keep them in the pantry. Some people cook the chickpeas with a little soda bi carbonate (baking soda) to soften them, but don't feel the need to do so. Soaking them overnight and pressure cooking them makes them soft enough. 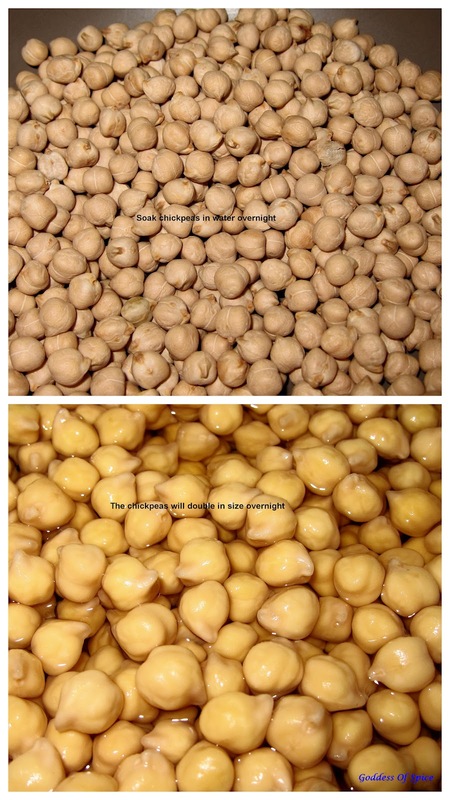 Soak the chickpeas in water overnight (10-12 hours). They will double in size by morning. Pressure cook this with a little salt and a tea bag till they are soft but not mushy. In the mean time, heat oil and saute the onions, green chillies, ginger and garlic with salt to taste till the onions turn translucent. Now add in the cumin powder, coriander powder, red chilli powder and amchur powder and mix. Before the spices begin to burn, add in the tomato puree and the cubed potatoes and give it a good stir. Add a little water and let this cook for about 10 minutes, till the potatoes get cooked. Now add in the chickpeas (after discarding the tea bag) and a heaped teaspoon of chana masala. Let this simmer, stirring occasionally for another 10 minutes. Turn off the heat and add the lemon juice and garnish with cilantro leaves. Serve hot with puris, bhaturas or chapathis. You could also garnish this with raw onions cut into rings and a couple of slit green chillies. You could use garam masala instead of chole masala. For the tanginess in the recipe, you could replace the amchur/dried ginger powder with a little tamarind paste. But I feel amchur powder gives it a more authentic taste.